Novy Afon Monastery north of Sukhumi was completed in the late 1800s. 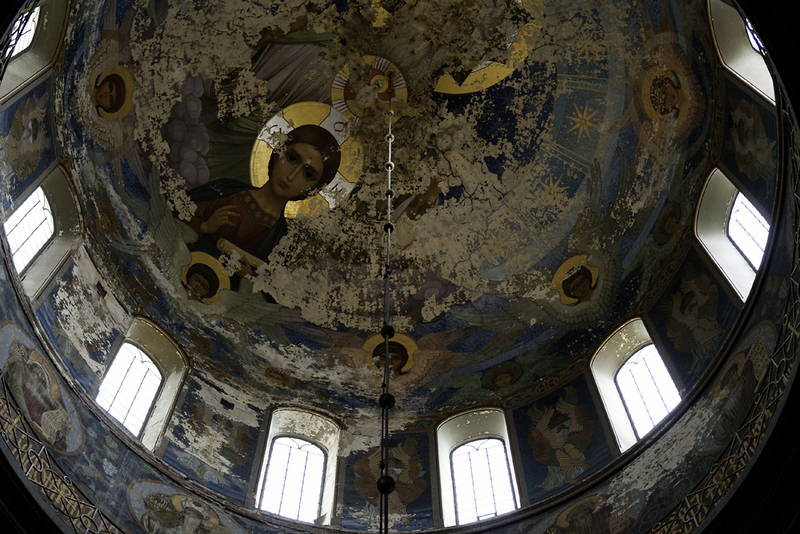 Paint chips away from most of the frescoes inside the cathedral of St. Pantaleon, within the center of Novy Afon. 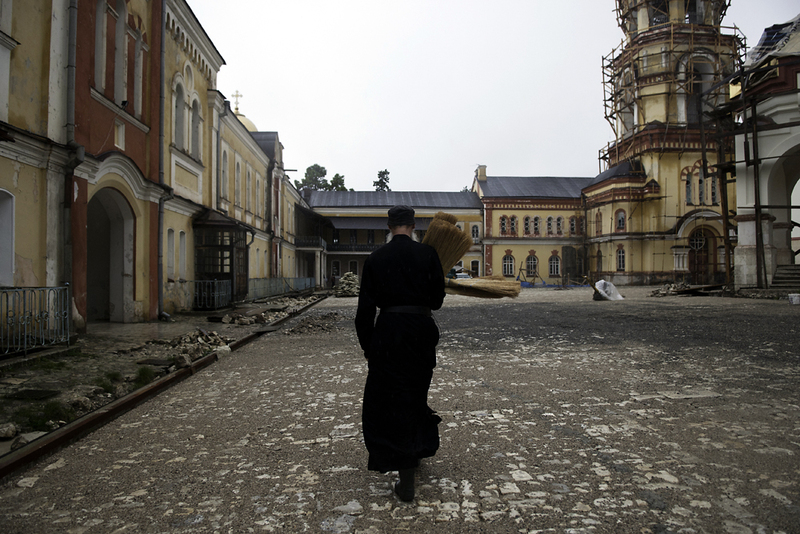 A monk carries brooms through the courtyard of Novy Afon, much of which is still under renovation with Russian money. Frescoes in the dome and the rest of the main cathedral at Novy Afon were painted from 1911 to 1914. A bridal party enters the courtyard of the monastery, which overlooks the Black Sea. During the Soviet era, monks were forced out of Novy Afon, which served for many years as a hostel. A man prays alone and in silence inside the main cathedral at Novy Afon. In recent years the Novy Afon sewage system was repaired and two new cupolas were added to the cathedral. A cow grazes outside Novy Afon, which is regularly visited by Russian tour groups. 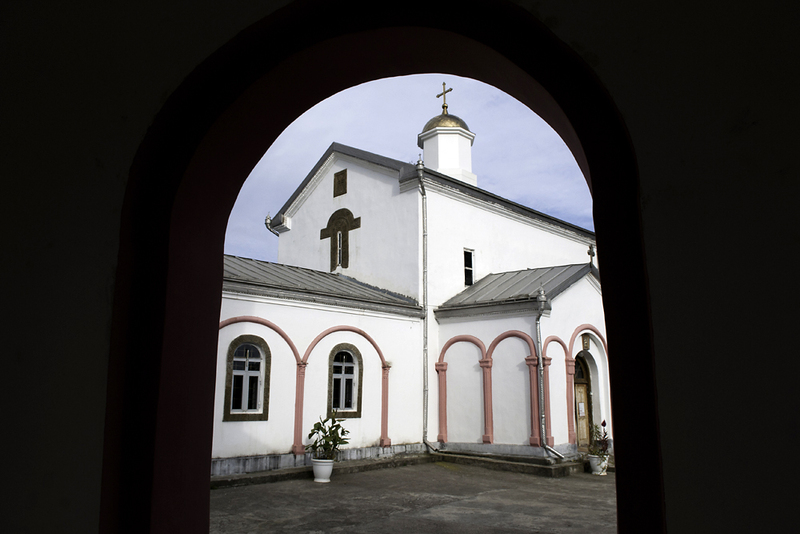 The Georgian Orthodox Church considers the Church of St. George of Ilori in southern Abkhazia a key medieval religious site. 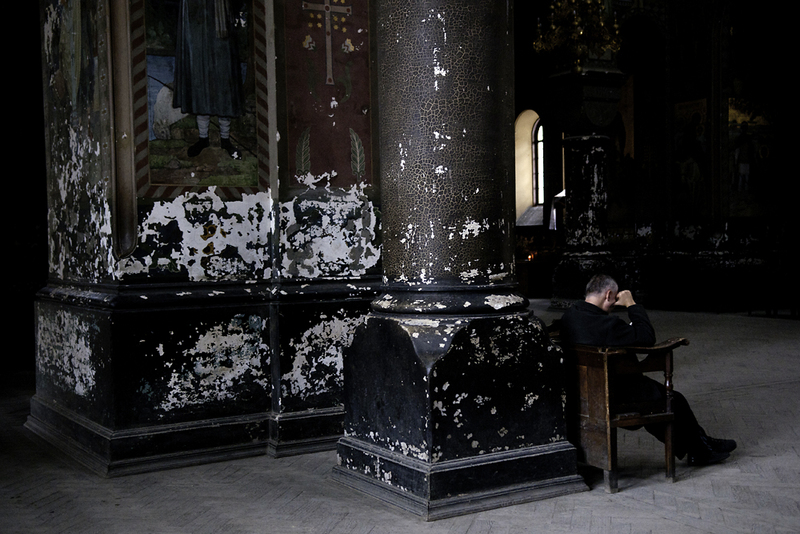 A woman prays and weeps loudly at the back of the Ilori church, which underwent significant renovation in 2010. 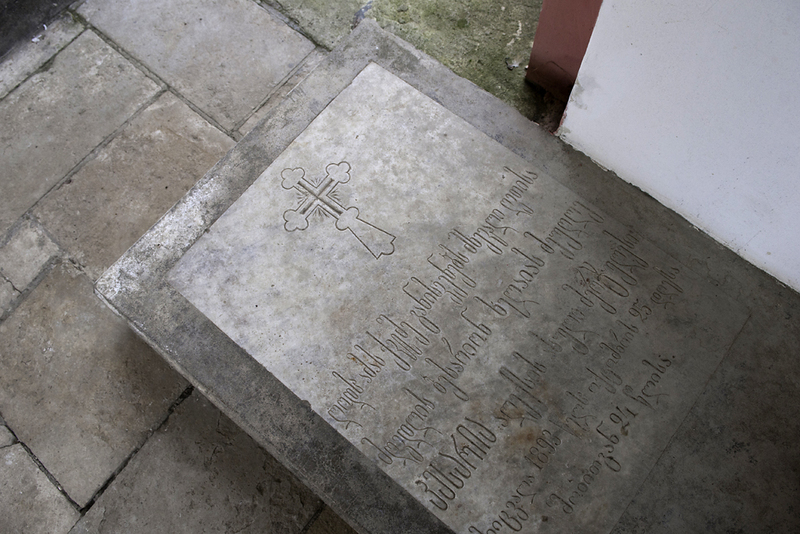 A grave at the Ilori church bears Georgian script on the solid rock covering. 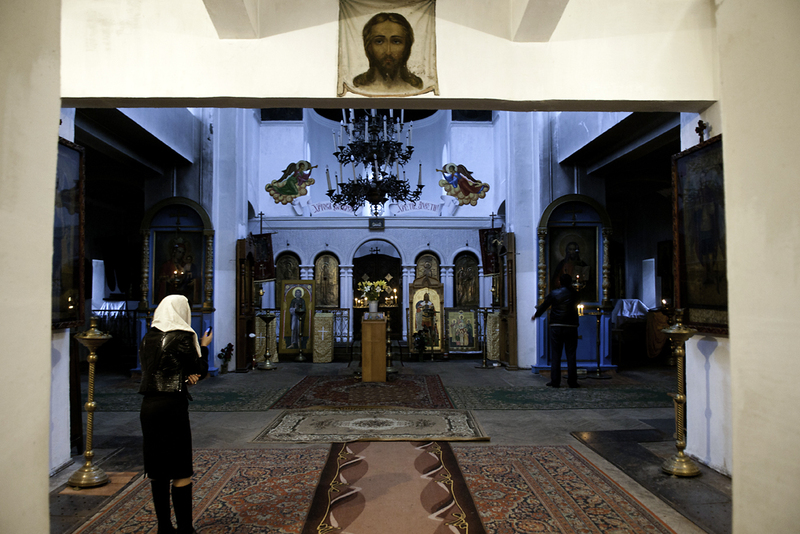 A woman prays inside the entrance to the cathedral in the Abkhaz capital, Sukhumi. 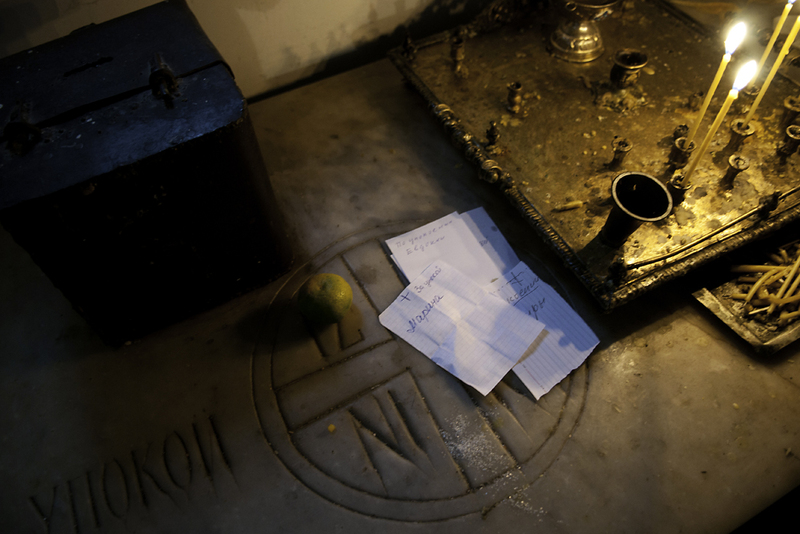 Notes, prayers and an orange lay on grave inside the Sukhumi cathedral. Father Vissarion Apliaa has declared himself the “interim bishop of the Abkhaz Orthodox Church." 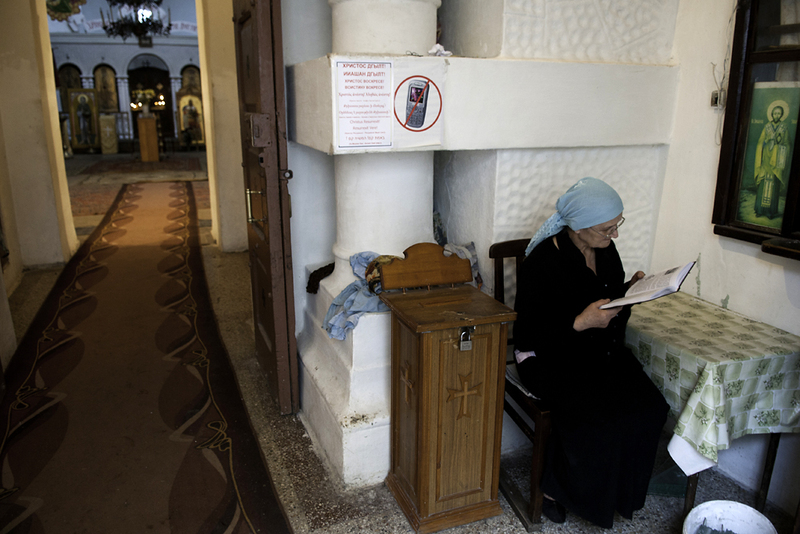 A woman reads a bible inside the Sukhumi cathedral, considered the center of the breakaway Abkhaz Orthodox Church. Russian tourists visit the waterfall next to the grotto and church of St. Simon the Zealot, located near Novy Afon. 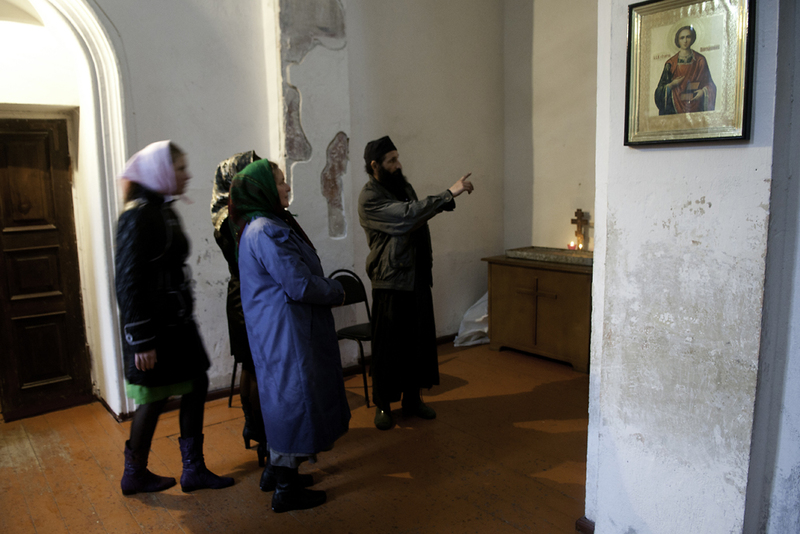 A monk tells visitors about the various icons on display inside the Church of St. Simon the Zealot. 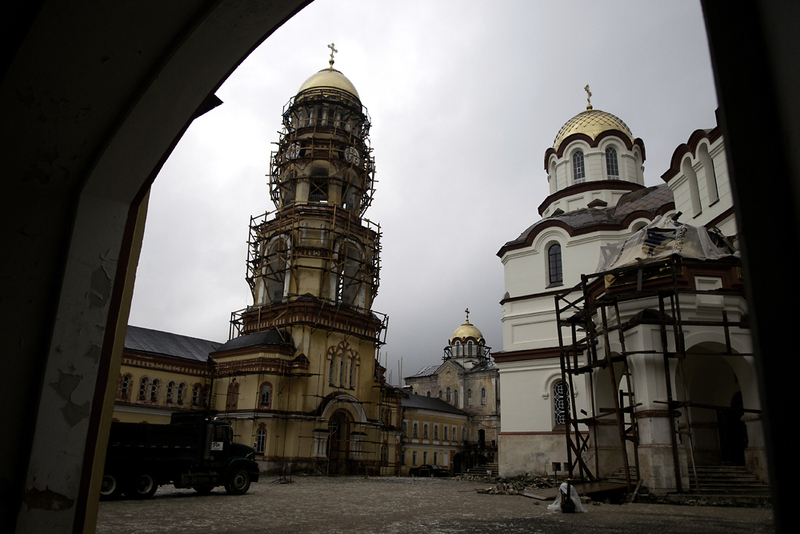 The 10th-century Church of the Virgin Mary near Lykhny is undergoing major renovation of the structure and facade. A volunteer in the Church of the Virgin Mary shows how to pray at the grave of Abkhazia’s last ruling prince, Georgy Chachba. The Church of the Virgin Mary is one of more than 100 churches located in Abkhazia. The church containing the grave of Prince Chachba is considered a significant historical site in Abkhazia. 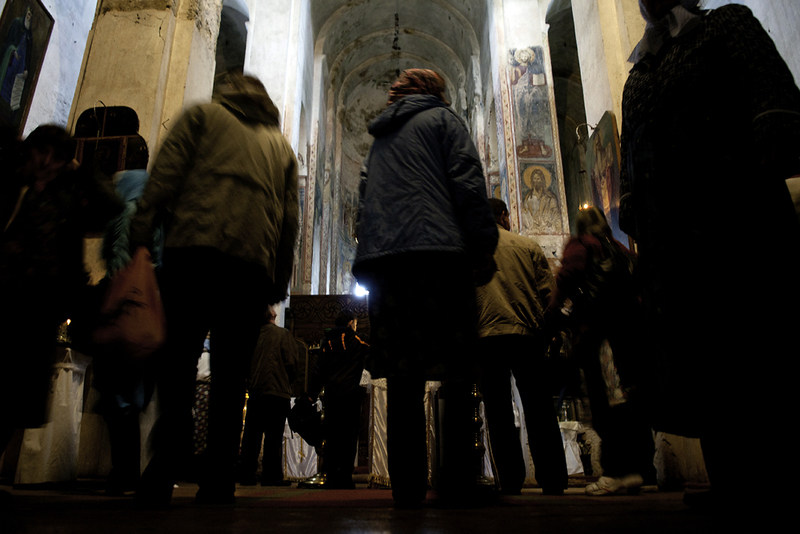 A Russian tour group visits the Church of the Virgin Mary. At the entrance to the cathedral in the Abkhaz capital, Sukhumi, one Saturday this summer, women kissed the hand of the white-bearded Father Vissarion Apliaa, the self-declared “interim bishop of the Abkhaz Orthodox Church.” Devotional items were displayed on a table near the door, including small pictures of the slain Russian Tsar Nicholas II and his family. 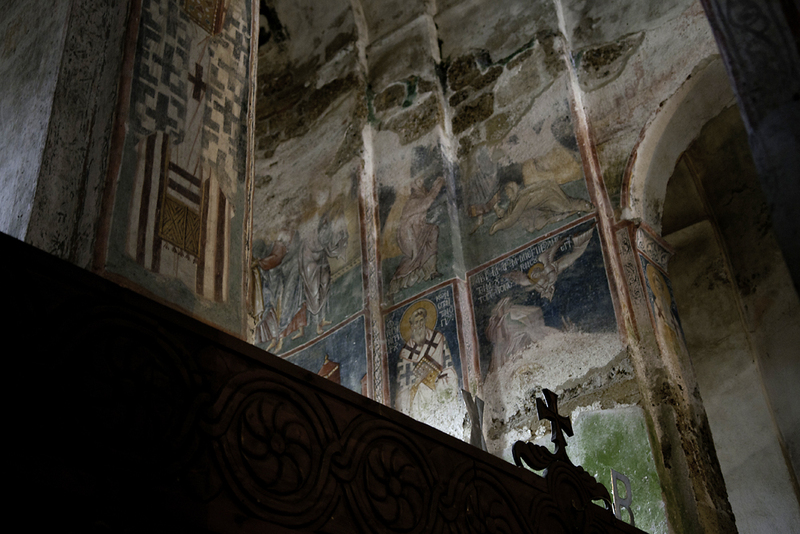 The Russian Orthodox Church may still technically recognize the Abkhaz faithful as being under the Georgian Orthodox Church’s jurisdiction, but Russian money finances the restoration of Abkhaz churches, and Russian workers apply the paint. 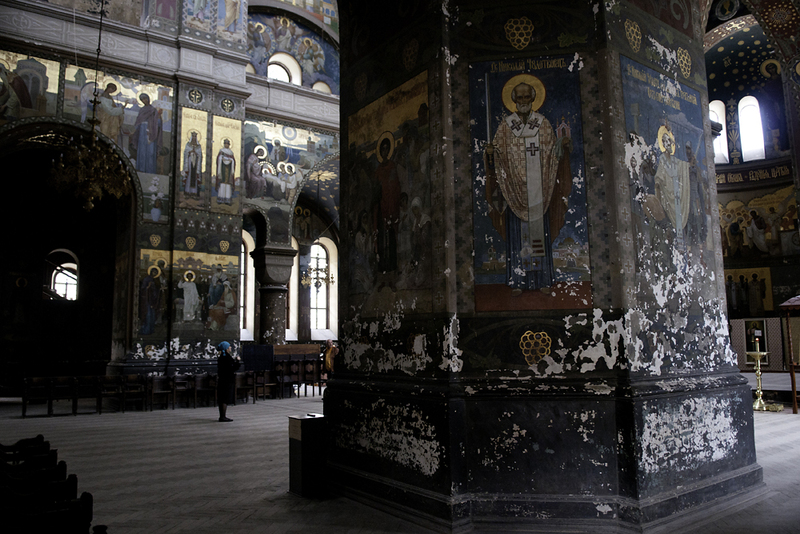 Russian Orthodox clergy have been filling the clerical gaps left after Tbilisi lost control of the territory in 1993. 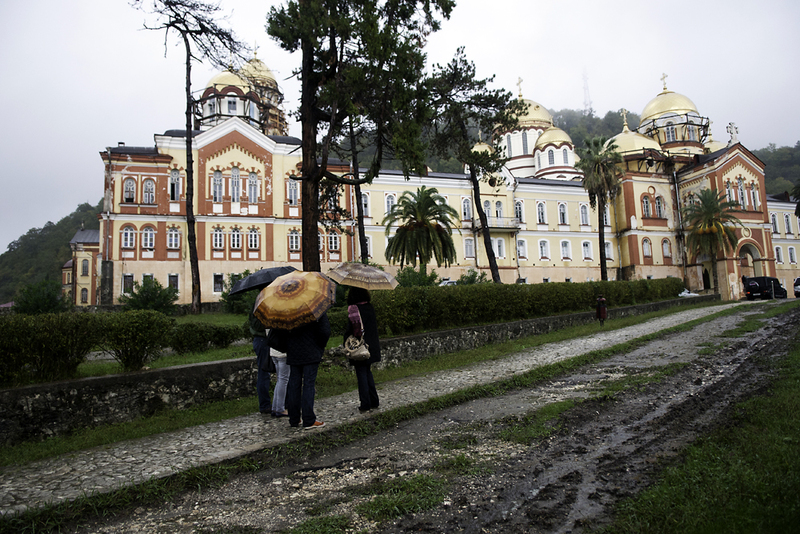 Today, 11 out of the 20 Orthodox priests in Abkhazia are from Russia, clergy say. The question for the Abkhaz faithful is how far they want that relationship to go. A portion of the Abkhaz clergy believes relations have already gone too far, and are actively resisting Russia’s creeping influence. In an office adorned with two portraits of Russian Orthodox Patriarch Kirill II, Father Vissarion, a priest who emerged as the de facto head of Abkhazia’s Orthodox community after 1993, maintains that close ties with Russia do not contradict the de facto Abkhaz Orthodox Church’s independence. "Who helped build the Orthodox Church?” he asked. “Russia! That’s why we wait for help from Russia." This past March, a decision to conduct the monastery’s services only in Greek and Russian, and not in Abkhaz, alienated many believers. 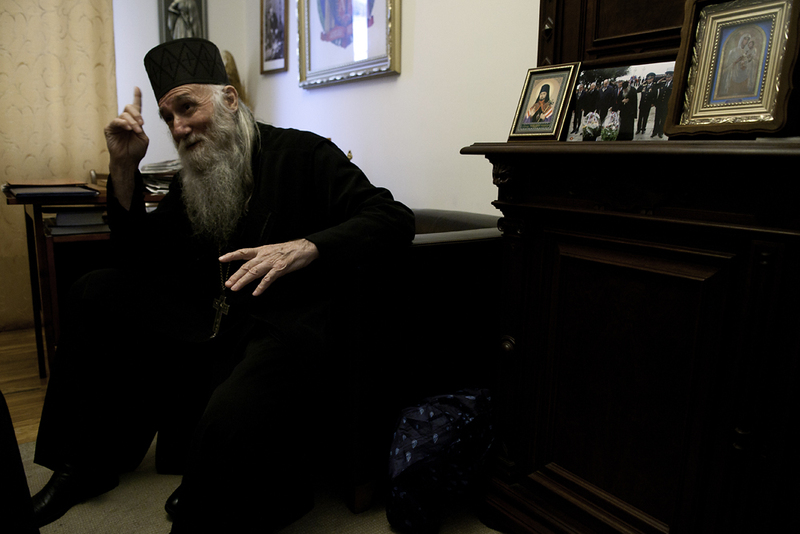 The order, made by the monastery’s Russian abbot, Father Ephrahim, energized a growing opposition to Father Vissarion. A May 15 meeting of 1,500 clergy and laymen, including de facto Abkhaz government officials, established a Church National Assembly that would circumvent Vissarion and act as the decision-making body for Abkhazia’s de facto church. The Assembly is appealing to the world’s 14 undisputed autocephalous Orthodox Churches to recognize the Abkhaz Orthodox Church as an independent entity. It also wants the Orthodox community’s “first among equals,” the Ecumenical Patriarchate of Constantinople, to set up a commission to review Abkhazia’s case. The Ecumenical Patriarchate could not be reached for comment. That leaves breakaway Abkhazia’s breakaway church with its own breakaway situation. Mirroring the political argument for Abkhaz independence, both Vissarion and Dorofei claim that the Abkhaz church was highjacked by Tbilisi in 1943 when the Russian Orthodox Church passed jurisdiction to the Georgian Orthodox Church, an institution whose oversight they reject. The Abkhaz church, they both insist, was originally made autocephalous in the 8th century. 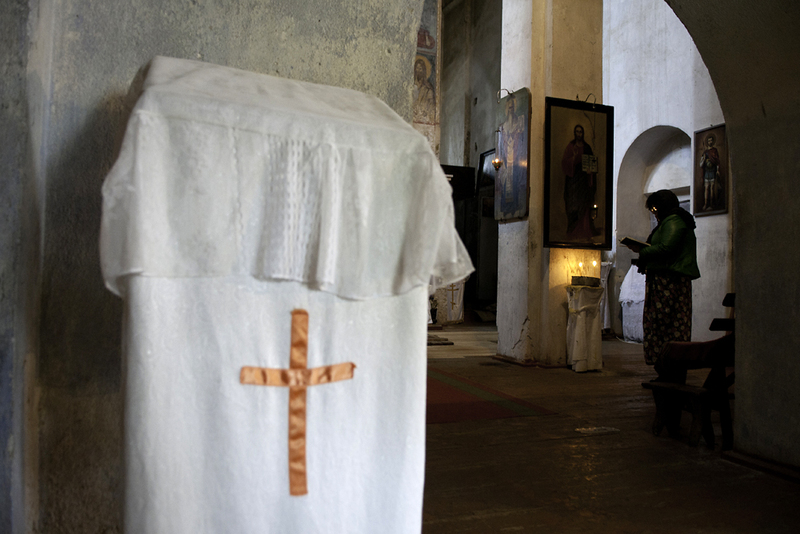 In the Caucasus, religion increasingly helps define national and cultural identity, but Abkhazia’s relationship with Orthodoxy is not clear-cut. Some observers have argued that traditional pagan beliefs and secularism run much stronger than Christianity. Abkhazia once also had a sizeable Muslim population, but most Abkhaz Muslims fled to Turkey after the Russian Empire took over Abkhazia in the early 19th century. 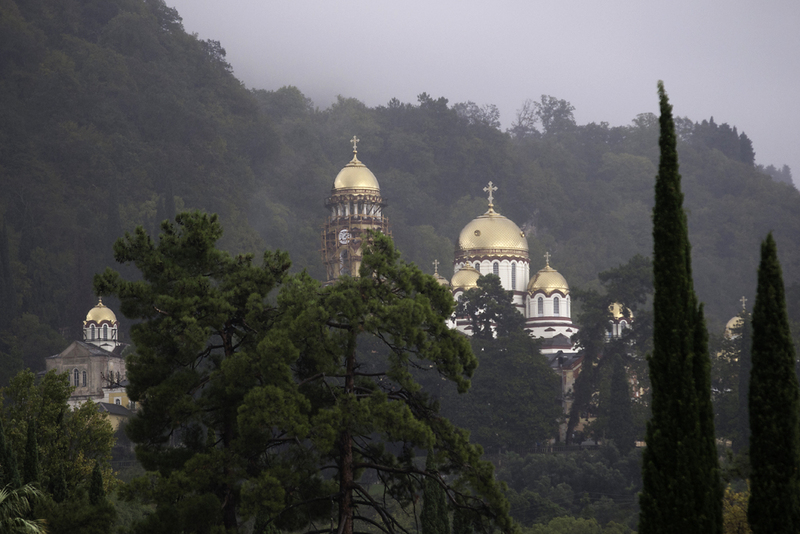 Liana Kvarchelia, deputy director of Sukhumi’s Centre for Humanitarian Programmes, says that while the church has not been particularly influential in Abkhazia, recently it has come to be seen as an institution that can consolidate Abkhaz identity. “It’s our church. Not Russia’s, not Georgia’s,” Kvarchelia elaborated. That view prevails in the parish of Lykhny, a village five kilometers to the north of Gudauta. The parish features a 10th century church that houses the remains of Abkhazia’s last ruling prince, Georgy Chachba, who died in 1818. 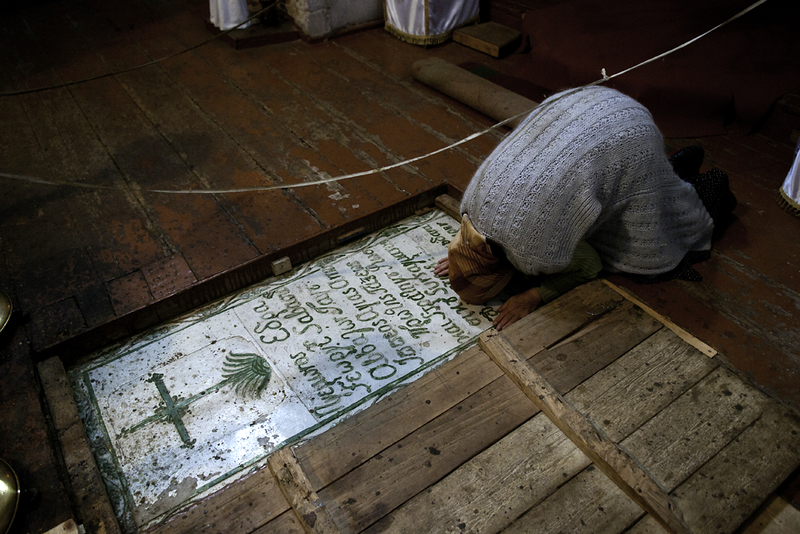 Inside the church, an elderly woman volunteer paused from tending to the icons to prostrate herself at Prince Chachba’s grave, a significant historical site in Abkhazia. “It will take away whatever negative energy, whatever bad thing surrounds you,” the volunteer said of the grave. “He takes it to himself,” she said of Chachba, with a smile. Reconciling that historical Abkhaz identity with Russia’s influence could prove the tricky point. 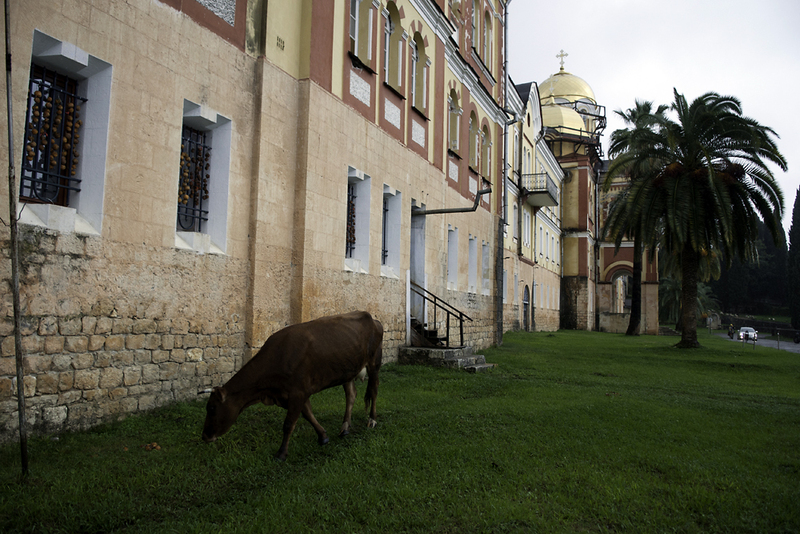 The Novy Afon monks, according to Kvarchelia, are reformists and relatively liberal, yet must be careful not to jeopardize relations with Russia, the first country to recognize Abkhazia’s independence, in 2008. Father Dorofei appears willing to take the risk. He concedes the chances that the Russian and Georgian Orthodox Churches will ever recognize an autocephalous Abkhaz Orthodox Church are slim to none, but maintains that the need for such a church nonetheless persists. 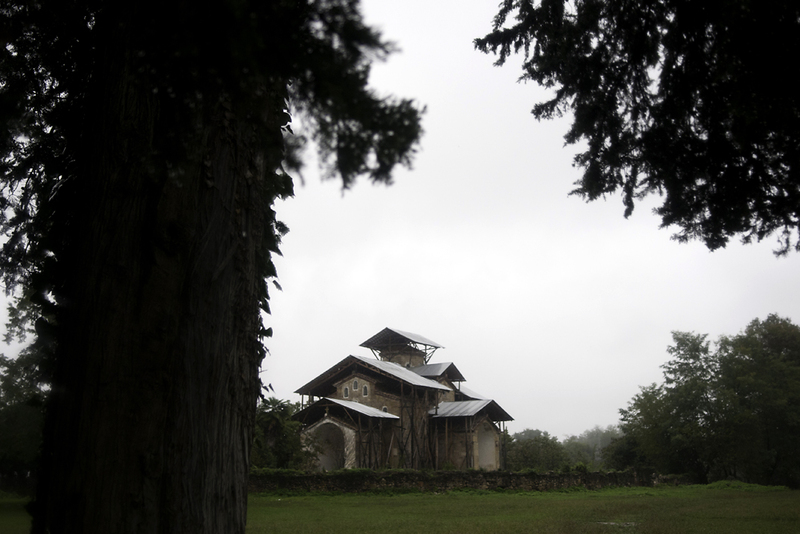 “When we say ‘Abkhaz Church,’ we’re talking about 150 churches on this territory. Whoever will control this will have a huge impact on the future of this country,” Dorofei said. Paul Rimple is a freelance reporter based in Tbilisi. Dean C.K. Cox is EurasiaNet.org’s photo editor. Elizabeth Owen, EurasiaNet.org’s news editor for the Caucasus and Turkey, also added reporting to this story.